5ft 6in Round Wooden Banqueting Table Hire• Size Imperial: L: 5ft 6in - W: ..
We’ve a wide range of tables for hire including trestle tables, round tables, cocktail tables, bistro tables and poseur tables. Our table hire prices are very competitive and we guarantee to beat any comparable rental quote. Casablanca Hire has earned its renown reputation for superior quality furniture hire and customer service. We're the team to turn to for table hire throughout London, including Hertfordshire, Buckinghamshire, Berkshire, Surrey and the South East. We offer a wide range of furniture hire, including table hire, chair hire, basically anything you need for the perfect event. We pride ourselves on providing the best personalised table hire solutions to meet the varied specifications of our many customers. Casablanca Hire has been providing furniture hire since 2005 and we continue to demonstrate our commitment to quality, affordability and timeliness. Need help planning set up? No problem. Our team of hire experts can help. We also carry anything to you need to set, dress up and decorate your table hire, from the linens to cutlery and more. Need furniture hire delivered, set up and taken down? We can help you with that as well. When searching for table hire, you need to be able to have complete confidence in the team you choose. Whether you're planning a wedding, garden party, birthday party, or corporate event, Casablanca table hire has you covered. 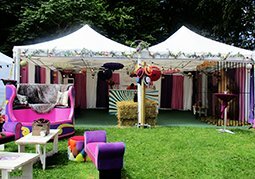 Our superior quality furniture hire, along with our stellar customer service, will ensure that your upcoming event is an impressive one. Casablanca Hire offers round table hire to suit any event. Our round table hire is one of the most popular for special events. These tables are sturdy, easy to transport and will fit into just about any setting. Our round table hire is perfect for just about any special occasion, including weddings, birthday party, garden party, christenings, family reunions, exhibitions and more. 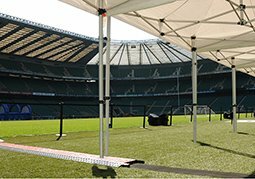 We're proud to say that we've provided our furniture hire for a long list of distinctive special events including festivals, the Rugby World Cup, Queen celebrations and more. Whether you are planning an intimate or major event, you can expect the same superior quality and customer service when you work with us. Our round table hire is available in dimensions that range from 3 to 6 feet. Our 3-foot round table hire seats 4, the 4-foot tables seat 6, the 5-foot tables comfortably seat 8, and the 6-foot tables can seat 10 to 12 people. These tables are also easy to transport, set up and move around. All our round tables are extremely durable, with sturdy folding legs (leg extensions are also available). Explore our round table hire options today and feel free to call with questions for a complimentary quote. Trestle table hire offers a level of versatility that makes them ideal for a wide range of events, including corporate events, exhibitions, market stalls and more. Our trestle tables are hired throughout the year for all types of festivals, career fairs, specials dinners, wedding events and sporting events, including marathons. There really isn't an event that trestle table hire couldn't be used for due in part to their versatility. Our trestle table hire is available in several sizes, have pristine table tops and durable folding legs. Available sizes that include 4-foot trestle table hire that seats up to 6 people and our 6-foot trestle table hire that seats 6 to 8. We also have square trestle table hire, popular for events and national venues that require exam desks. Leg extensions are also available for most of our trestle table hire. 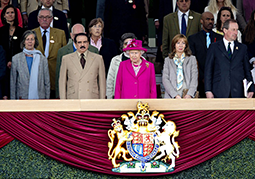 For trestle table hire in London, you only need to keep one name in mind - Casablanca Hire. Take a moment to explore our trestle hire and other table hire options. Have questions? Contact our friendly, knowledgeable table hire team today to talk about your requirements and to find out which of our trestle table hire options best suit your needs. It might not be obvious, but the quality of the chair hire can actually play a significant role in the overall appeal of your special event. When you think about it, the chairs are usually the one of the things most people notice as they walk into an event environment, meaning they quickly set the overall tone for the rest of the setting. Sometimes people get so caught up in the appearance of their decorations and linens that they overlook the impact the chair hire can have on the setting. The pricing of our cheap chair hire doesn’t influence quality either. In addition, you can hire tables and chairs from Casablanca Hire that perfectly complement each other. Our chair hire range includes Chiavari chairs, folding chairs, bistro chairs, bentwood chairs, banqueting chairs, high chairs for the little ones, and more. In our humble opinion, superior quality chair hire can elevate any event. We carry several different options at Casablanca Hire, including cheap chair hire that doesn't cut back on quality. Take a moment to check out our chair hire range and give us a call for more information. Need styling tips? We're here to assist you. One of our most frequently asked questions is from customers who need help matching the right style of chair and table hire to complement their vision. We can help here too, even providing styling tips for all our chairs. Just give us a call – we are here to help.